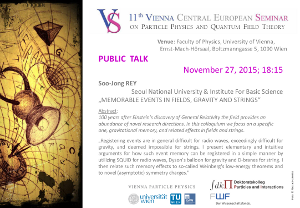 We cordially invite you to participate in the eleventh “Vienna Central European Seminar on Particle Physics and Quantum Field Theory”, which will take place at the Faculty of Physics of the University of Vienna, Boltzmanngasse 5, A-1090 Vienna, from Friday November 27 to Saturday November 28, 2015. This year “Quantum and Gravity” has been chosen as subject. We kindly ask all participants and speakers to fill in the online application form before September 30, 2015 October 31, 2015. All participants applying afterwards are asked to do so at the registration. These persons will, however, not be included in the list of participants, which will be distributed at the meeting. 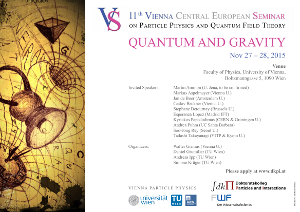 The seminar series “Vienna Central European Seminar on Particle Physics and Quantum Field Theory” was created 2004 (see seminar 2014 other previous seminars) and is intended to provide stimulating interactions between leading researchers and promising junior physicists. A considerable number of junior scientists participate in these meetings, and we receive special grants for them covering the hotel and part of the local expenses.